Here are some pix of the wrecks and Pattaya made during of our recent trip. Got all pix together at last, from both Jamie and Marcus, so thanks guys for letting me have them pix. Unfortunately I forgot to bring my underwater housing! DUH!! 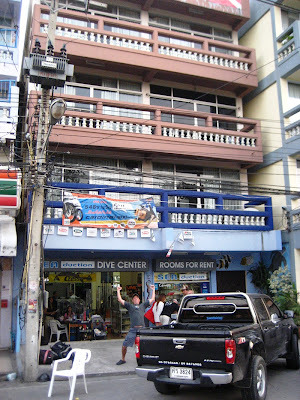 This is a shot of Seaduction, the shop we used for our trips. I can only highly recommend, they're experienced and small enough to being able to cater to small groups like ours so we had two dives per day on three consecutive days on a different wreck each day! They also own their very own boat which makes it fairly easy to dictate where they want to go and who they want to take along. They're also very friendly and laid back, which makes live so much easier! 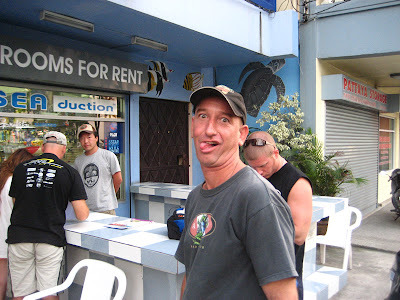 This is Danny, he's the guy you have to deal with if you want to go diving with Seaduction, you have been warned! He's also very knowledgeable about the dive sites and the wrecks in particular. If you ask him nicely, he may take you on for his Advanced Wreck diving course, where you get to explore all the crooks and crannies of the wrecks visited. A picture of the HTMS Khram. The Khram has been sunk by the Thai Navy about 5 years ago (around 2003), so there's a lot of marine life growing on the wreck, very different than the drawing as shown in the link to The Khram. This also makes part of the attraction to wrecks, the abundant marine life as they become habitats for plants and coral as well as various fish. This photo was taken by Jamie St. John. A shot from the Hardeep. 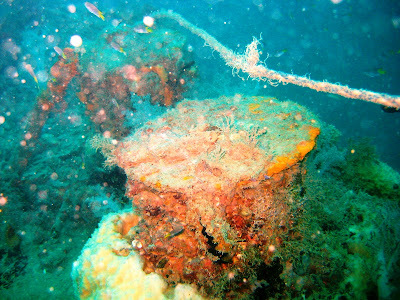 Not as recognisable at all as a wreck but a very interesting wreck, from World War II. I bought a DVD about the ships history and that is very interesting indeed. If you have the chance, try to have a look at it. The ship is originally called the Suddhadib and an unexploded bomb of the original attack lies within a 30 meters range of the wreck. This photo has been made by Marcus Han. 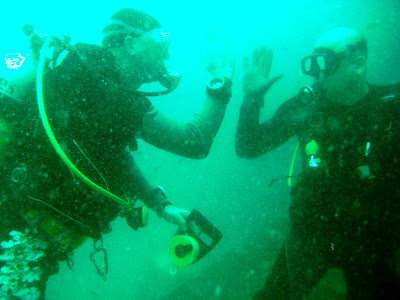 Here's me and Steve high fiving each other after he completed his wreck diving specialty. Hope you enjoyed the pix and let me know if you're interested in organising a wreck dive trip in Pattaya with me. For more information about Thailand's wrecks, please visit Steve Burton's Thai Wreck diver website, a vast source of information about the various wrecks that are scattered around Thailand.